Lopesan Hotel & Resorts, the makers of happy memories. We offer the best quality and personalised service for your holidays. Discover all what we offer! At Lopesan Hotels & Resorts we are leaders in the tourism sector in the Canaries thanks to our personalised service and ongoing commitment to technology. We build and manage top-level hotels and resorts in coastal areas of Spain, but also abroad. At the different Lopesan hotels we offer top-quality products and services that set us apart from competitors. Also, all the Lopesan staff are prepared to offer you everything you need during your visit. At Lopesan hotels we believe that the care and closeness of our staff are values that make the difference. Our team is prepared to give effective responses to our guests, and also be humane and supporting. Because that is the only way to make holidays unforgettable. We are aware that our friendliness is essential to ensure that the experience of guests at Lopesan hotels and resorts is always magnificent. Also, we offer products and services adapted to your characteristics and specific preferences. If you want to stay at a hotel whose unique architecture will transport you to other era, you cannot miss out on Lopesan Hotels & Resorts. We really care about the architecture of our hotels and leisure spaces with original, top quality structures, with authentically Canarian settings and décor. This care and dedication means that all the Lopesan hotels in Gran Canaria are recognisable and different to those of competitors. And that is no surprise, as this architectural originality is part of the “hallmark” of Lopesan Hotels & Resorts. The warm and welcoming Canarian character shows in our work. 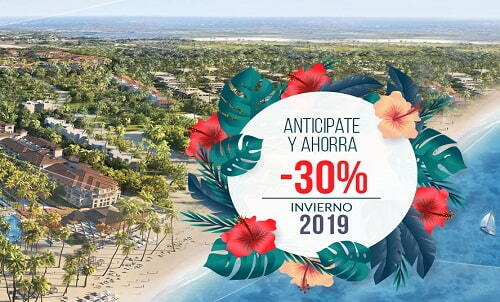 Not for nothing, Lopesan hotels are a benchmark in the Canaries and will soon have a presence in the Dominican Republic. We love our work and take care of every detail to make your stay with us unforgettable. Thanks to our experience we know that the important thing is not only knowing about our business, but also the regions where are our hotels are located. And, of course, understanding what clients want. Otherwise, it would be impossible to offer products and services to suit the needs of all of our guests. Part of the success of our Lopesan Canary Islands hotels based on our pioneering spirit, which leads us to growth and ongoing innovation. We make a strong commitment to technology as a means of being able to offer the best service to our clients. Thanks to computing we compile data that helps us to discover not only the level of satisfaction with Lopesan Hotels & Resorts, but also the tastes and preferences of every guest. Thus, we constantly improve our offer and make the Lopesan experience unique. A holiday full of luxury, entertainment and sprinkled with an exotic touch is now possible at Lopesan Baobab Resort. 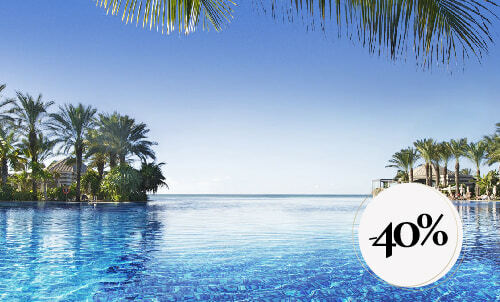 This 5-star hotel in Meloneras (Gran Canaria) offers the most select customers an environment which evokes African countries; from the wild appearance of its flora, to the colour of its buildings, earthy and intriguing just like the slopes of Kilimanjaro. Sometimes, all we need is a suggestive and captivating environment, without giving up the comfort and relaxation we desire in our daily lives. Therefore, this exclusive Gran Canaria resort is one of the most original, striking and spectacular hotel complexes on the island. The first thing you notice about this Gran Canaria hotel is its appearance. With a façade imitating African elements, a colossal entrance to welcome guests and lush vegetation, the Lopesan Baobab Hotel impresses at first glance. But you just need to go through its doors to realise it has much more to offer. Anyone who stays here will discover, surprisingly, that the rooms and the services and the gastronomic offer are spectacular. Holidays are a special time for us to load up with positive energy so that we can go back to our daily lives with our batteries recharged. The Lopesan Costa Meloneras Resort & Spa is a magical place in Meloneras, the most exclusive tourist area in Gran Canaria. The Maspalomas Dunes Nature Reserve's desert landscape provides a unique backdrop where you can daydream and relax whilst talking long walks along the beach. 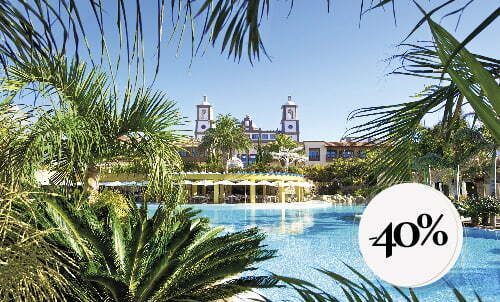 As soon as you arrive at this Casino Hotel in Gran Canaria you will be welcomed by a majestic palace. Its windows, doors and archways take visitors back to colonial times, which is typical of the Island’s architecture. Once you've crossed the entrance, more than 2,000 palm trees guide you to your room, making you feel like you're in an oasis in the middle of the desert. Everything is designed so that you can relax, feel and experience the typical Canary culture in a warm, welcoming environment that mesmerises you from the get-go. Lopesan Villa del Conde Resort and Thalasso is the only hotel of its kind in gran canaria, not only in terms of the services it offers but also because of its unique design. When they walk through the doors, guests feel like they are in a typical canary island village: balconies, façades, fountains... Everything reflects the typical, traditional island architecture, creating a warm and friendly atmosphere that enchants visitors right from the start. As soon as you arrive you walk into reception, cleverly built like a neoclassical church; the rooms are laid out like a stately home and the central square is in the same style as those in the villages all over the island. Gastronomy, including restaurants, cafés, cocktail bars and poolside dining areas. Each one features a full menu with local and international specialities, creating an unforgettable culinary experience. Lopesan Costa Bavaro Resort Spa & Casino is a hotel located at Playa Bavaro, in the Dominican Republic. The beach with its white sand and turquoise water, the island's tropical climate which is warm all year round, and the abundance of lush greenery all come together to create a truly unique spot and a real treat for the senses. Spread over more than 100,000 m2 and boasting 5 stars, the Lopesan Costa Bavaro Hotel has many green areas and 6 freshwater swimming pools. One of these is the popular infinity pool, which has two levels - one at the height of the hotel and the other connected to the beach itself, thus linking the beach and hotel. There is also a pool for kids. The hotel also has an adults only area with futons, hammocks and balinese beds, allowing guests to completely unwind during their stay with us. The Lopesan Costa Bavaro Resort also stands out thanks to its impressive all-inclusive range of culinary options, which cater for all tastes. In addition to 2 buffets which offer international, national and regional cuisine, guests can also take their pick from Mexican, Mediterranean or Asian food, or head to the Steak House, a typical Italian trattoria or an American Grill. Also not to be forgotten are the hotel's 2 beach clubs, the lobby bar and its 4 pool bars. Last chance to enjoy this special price for your stay in April at our most emplematic hotel. Subject to availability, minimum stay. Last chance to enjoy this special price for stays in April at our fabolous hotel. Subject to availability, minimum stay.